I recently sat down with Brian Babikian, also known as The Spike King, to discuss his goals in Digital Sports Media, and how he’s coping with his newly minted celebrity status. You can find him on nearly every Boston and Rhode Island news station imploring Pat’s Nation to #RIDETHEWAVE. You most likely recognize him as “the tattoo kid” — or the guy that “looks like a young Gronk.” He’s gained local (and now national) notoriety for sporting a massive ‘Pats Champs, Super Bowl LIII’ tattoo, which he recently had inked on his upper arm. 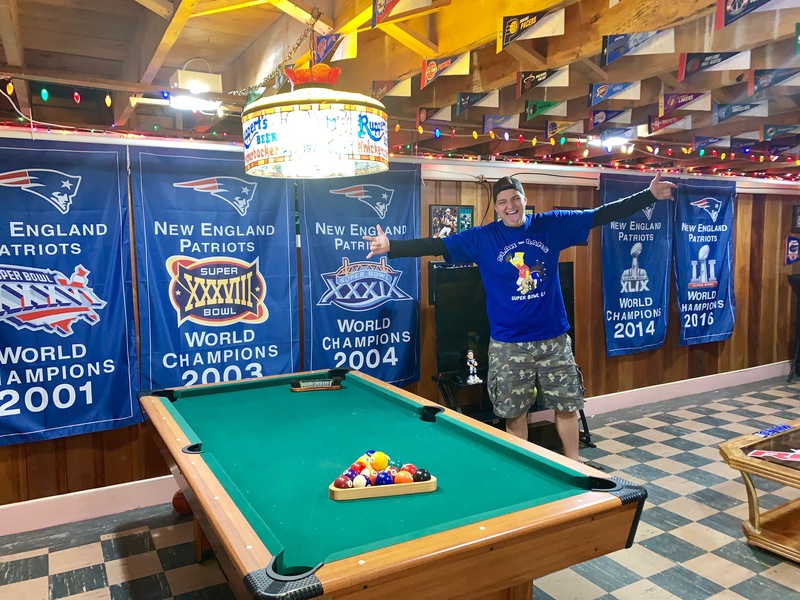 Brian’s basement is filled with special memorabilia and decked out with Patriots’ flags and jerseys. It’s the perfect spot to watch the game — the vibes are unreal. The week after the AFC Championship, Brian went on a literal press tour in New England, doing a guest spot on nearly every popular radio show and news station from Boston to Providence. Now in Atlanta — he’s been invited to be at the Rich Eisen show and be on Good Morning Football — twice . He’s (respectfully) going toe-to-toe with these NFL Network giants and giving his two cents on his pick for Sunday. He chalks up his newly found digital fame as apart of a ‘youth movement in digital sports media.’ Brian is emblematic of this generation of young and vibrant influencers carving their own path to success and redefining what traditional, or mainstream, success looks like. Brian embodies this new wave of digital influencers who can garner attention and success without climbing the same ladder that mainstream personalities were previously beholden too. His long term goal is to grow his brand by being himself and directing attention to the causes he’s passionate about. He adds, “at the end of the day it’s a game on Sunday and if you lose we still have something we are working towards.” However, periodically throughout the interview he said bluntly, “we’re not losing on Sunday” — with a sense of certitude that I can only assume an Oracle may have. Follow @thespikeking on Instagram to keep an eye out for his charitable endeavors. Most notably, please check out the gofundme for Tedy’s Team run by a young fan, Jake and his family, to help raise money for Tedy Bruschi’s Charity. You can read more about the charity and Jake’s mission by following @thespikeking on instagram and clicking the link in his bio! At the end of the day, people will hate on the winning team and they will certainly hate on the fans of said winning team. However, Brian’s sticking his neck out and putting a virtual bullseye on his back by boldly supporting his team and nationally publicizing his passion for the Pats. He commented on the ‘haters’ and said, “2018 is all about learning experiences — you know? How far can I push something without changing who I really am. I mean, I’m still your average beer drinking, loud mouth, SOB — but at the same time, I’ll tone all of that down if it impedes [or hinders] on my goal of trying to do something positive.” He is learning to strike a balance between being authentically himself, which is what garnered him notoriety in the first place, and simultaneously embodying the mission statements of the charities and organizations he works with. At the Chargers game, Brian was approached by a West Coast fan who said, “Hey aren’t you that Instagram guy? You’re a loser.” Brian brushed it off and kept his eyes down-field focused on his ultimate goal — he maintained composer despite haters aiming insults at the target on his back. After the game, he went on the field and shook hands with the Kraft family and exchanged words with some of the most recognizable Patriots affiliates and personalities. Now, Brian is tearing up Super Bowl week in Atlanta and gaining a plethora of new followers — both haters and fans alike. When this interview occurred, Brian rested comfortably at 17.5K followers, and now he sits at 19.1K — that is over nineteen thousand potential supporters for his team and the causes he holds near and dear to his heart.